Liv Tyler rocks an all-black outfit while heading into Heathrow Airport for a flight out of town on Wednesday (November 21) in London, England. The 41-year-old actress was en route to Maine, where she spent her Thanksgiving holiday. Liv took to her Instagram Stories to share photos of the snow-filled scenery. She showed how the temperature was nearly 0 degrees Fahrenheit and there was snow and ice everywhere! Sounds like Liv had a very cold Thanksgiving, but we hope she had a great one! Liv Tyler Seen Out & About for First Time in Weeks! 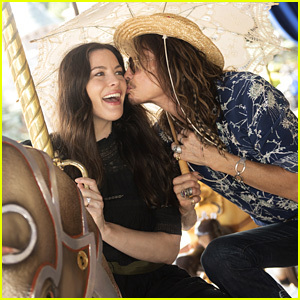 Steven Tyler & Daughter Liv Take a Trip to Disneyland Paris! Liv Tyler & Uma Thurman Celebrate Formula E's Season at Championship Awards!